I’m sure that many of you have wondered what’s happening with me, as I haven’t been in the paper at all in the last four or five weeks. The fact is that my not so old, (less than three years) computer had some problems at start up. It just wouldn’t run for whatever reason. While I was away on vacation in Vermont, the Mrs. dropped my machine off at one of our local computer repair shops. They had it back up and running in no time. Anyway, I’m back home and back in the business of bringing you my little bit of the outdoor world. Anybody who has spent any time out in the forest this fall would surely notice that acorns and beechnuts are conspicuously absent from the landscape this year. After several years of abundant crops, many of the oaks and beech trees just didn’t produce this season. I’m certainly no expert on the subject, but after nearly a half century of being in the woods, I’ve witnessed the cycle of the trees. They’ll do well for a few years and then they seem to be simply barren for a season or two. I guess it’s just a natural cycle. I am reminded of a verse from the bible, in the book of Ecclesiastes, “unto all things there is a season.” The woodland creatures that depend on the fall nut crops will surely have a difficult time getting by this winter on the meager food sources that are available. This week’s photo was taken by my good friend Steve Oakes of Terryville. 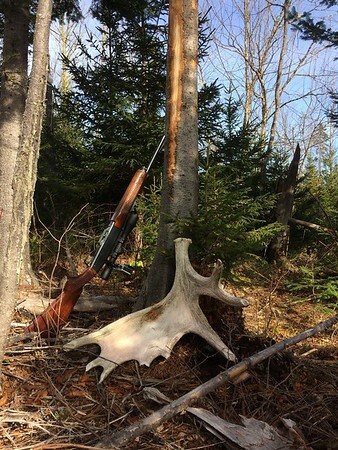 Back in November, Steve and his son made the journey to their hunting camp in northern Maine. While out in the woods on a day’s deer hunt, Steve came upon this example of a shed moose antler. The antler is posed against a tree that had been “rubbed” by a moose earlier in the fall during the moose rut, or breeding season, which is usually in the months of September and October. In addition to finding the moose antler, Steve was also lucky enough to bag a very nice buck during his time in the north woods of Maine. In other outdoor news, the State of Connecticut has recently acquired 72 acres of land which abuts the Roraback Wildlife Management Area in Harwinton. The property is located just off Swimming Hole Road and Whetstone Road. At present, the land is not open for hunting during the 2018 hunting season. As of this writing, I am not able to confirm what type of outdoor activity the land may be used for in the future. For now however, please respect the fact that the property is closed to all hunting. Obey all postings and boundary markers. We as hunters and fishers have an obligation to always do the right thing, even if there is no one around to judge us. Being a good steward of the lands and waters we use will ensure that these things will endure for future generations. As always, enjoy the outdoor world. Posted in The Bristol Press, General Sports on Wednesday, 5 December 2018 21:16. Updated: Wednesday, 5 December 2018 21:19.